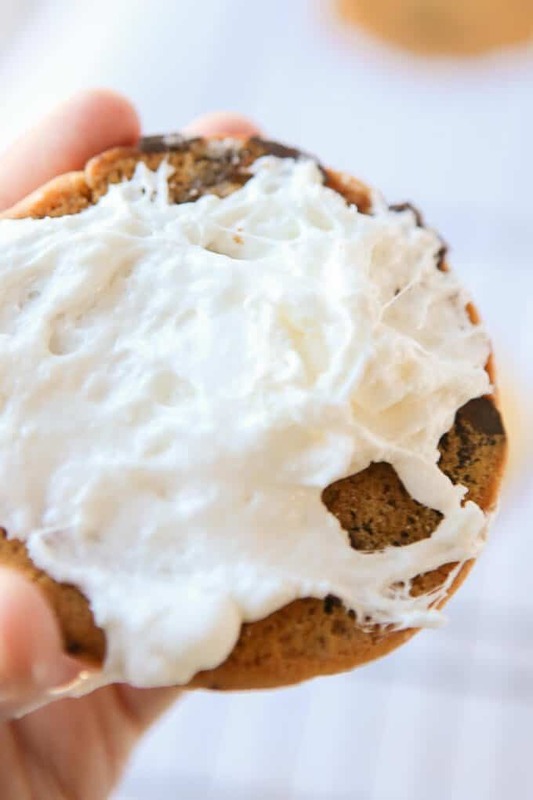 This cookie s’mores recipe is the perfect way to celebrate National Cookie Day, an easy dessert everyone will love! It’s tough to live so far away from family, so I jump at every chance I have to go visit. A couple of weeks ago my little family went and joined the rest of my immediate family for a three-day adventure in Branson, Missouri. If you’ve never been to Branson, it’s a great little town for families. As people referred to it, it’s like Las Vegas for really old and really young people. We fit in perfectly with our four generation group (my two-year-old K being the youngest). The main reason we went to Branson was to go to Coaster Christmas at Silver Dollar City. Oh wait, you’ve never heard of Coaster Christmas? Yeah, most people haven’t. It’s this special once a year event for ACE (American Coaster Enthusiast) members. And yeah we’re all card-carrying ACE members. Basically Coaster Christmas is a two-day event thing where you get to go into the park early, get free stuff, and learn more about a couple of the big midwestern amusement parks. 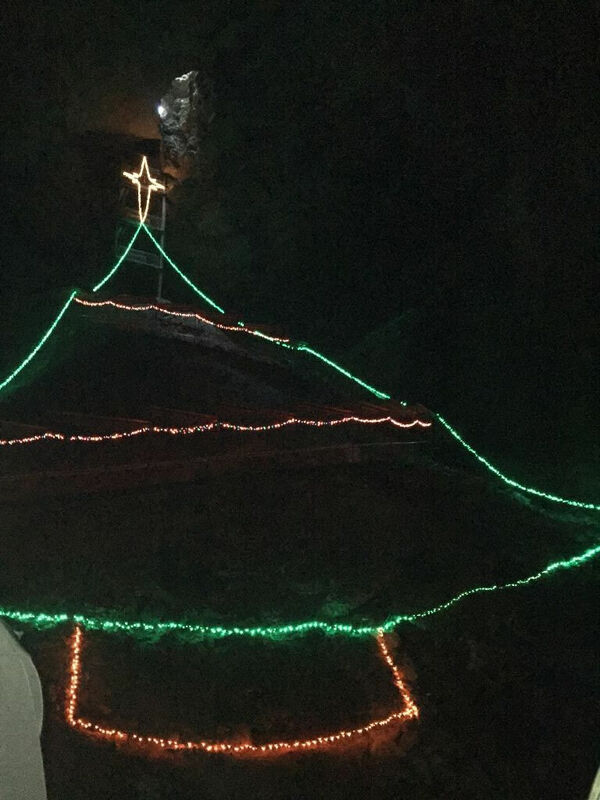 During Christmastime, Silver Dollar City completely transforms and becomes a Christmas wonderland with thousands of lights, Christmas shows, and winter themed food stations. It reminds you why Christmas is so magical in the first place. On day two my parents volunteered to take all of the grandkids for a few hours to the kiddie area so the adults could have some time to go on the coasters, watch a show, or just walk around without having to fight a screaming kid who wanted to go on the fire dog ride for the millionth time. After crossing the Silver Dollar City coasters off my list (yes, there’s a coaster spreadsheet), me and my husband decided to ditch the rest of the adults and make a little mini date out of the night. We don’t get to do that nearly often enough and never in magical Christmas land. While we were exploring we came across a s’more food kiosk. 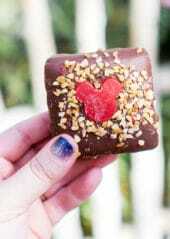 I’m a s’more and amusement park food addict, so trying it out was a no brainer. They put your marshmallows on a stick and you actually toasted them yourself right over a little fire they had set up outside the kiosk. But that wasn’t the most amazing part. 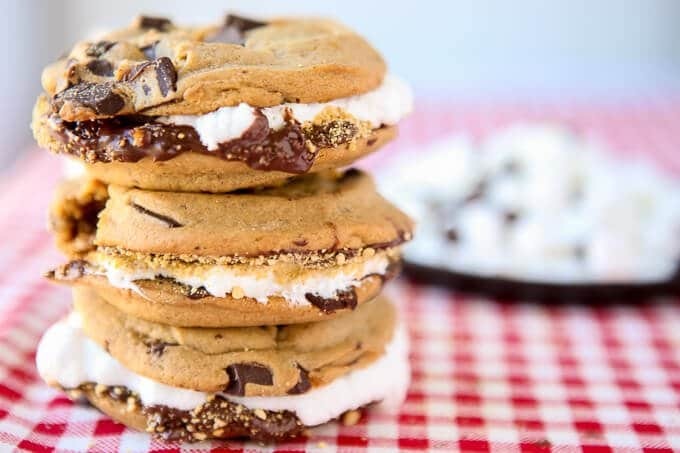 Instead of graham crackers, you put your toasted marshmallows onto a chocolate chip cookie smeared with melted chocolate and sprinkled graham crackers. I’m sure people have made s’mores out of cookies before, but I’ve never had one. And I’ve certainly never had one in the freezing cold at an amusement park. It was amazing. Fast forward to today and it’s national cookie day. And guess what I made for national cookie day? 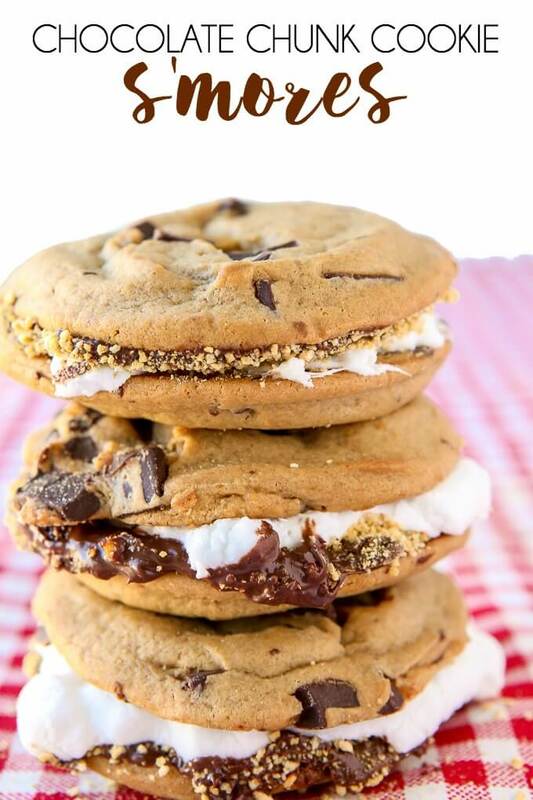 Yep, chocolate chip cookie s’mores. Marshmallows, chocolate spread, and graham cracker crumbs all smashed in between two soft chocolate chip cookies. 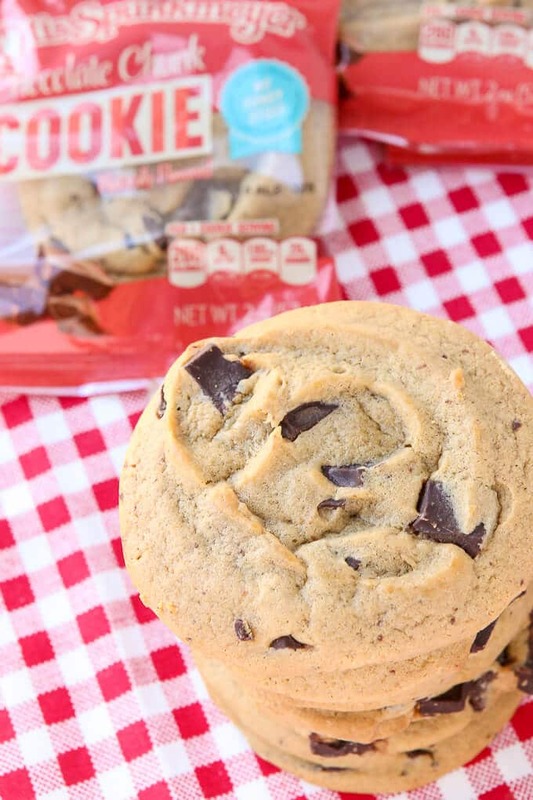 It’s pretty much the best way you could celebrate national cookie day or any day really. To keep it as easy and delicious as possible, I used Otis Spunkmeyer Chocolate Chunk cookies from their new no Funky Stuff line of products. No funky stuff, meaning no artificial colors or flavoring, no high fructose corn syrup, and no artificial or over-processed oils. 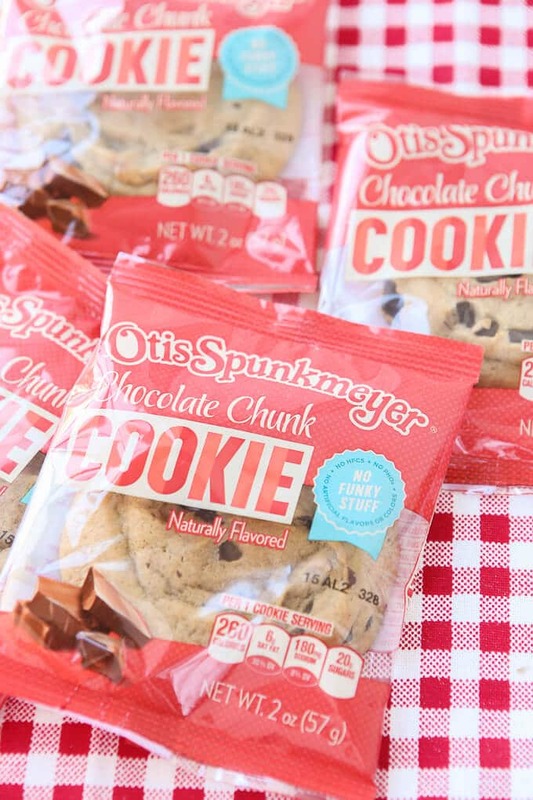 Say goodbye to all that funky stuff you can’t pronounce in an ingredient list without losing any of the delicious fresh-baked cookie flavor Otis Spunkmeyer has been known for the past 40 years. I received a little sneak preview of their new line that I used for this post, but starting in 2016, the full line (loaf cakes, snack cakes, muffins, cookies, cupcakes, and cookie dough) will be available at retailers around the country and on Amazon so everyone can have cookie s’mores whenever you want. Okay so you’ve got your cookies and they’re delicious. Check. 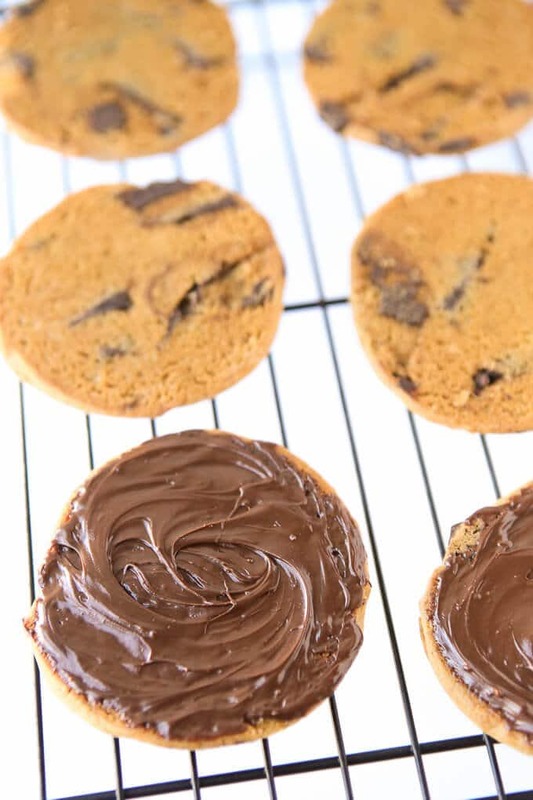 Next up, you’re going to spread either melted chocolate or a chocolate spread on the back of one cookie and sprinkle it with graham cracker crumbs. After you’re done with that, it’s time for the fun part. You can either actually roast a marshmallow if you have say a fire pit in your backyard, or you can microwave marshmallows or even bake them like I did for my sweet and salty s’mores. The only requirement is that you want to get them nice and melted without burning them. I microwaved a bunch of mini marshmallows for about 30 seconds on high. 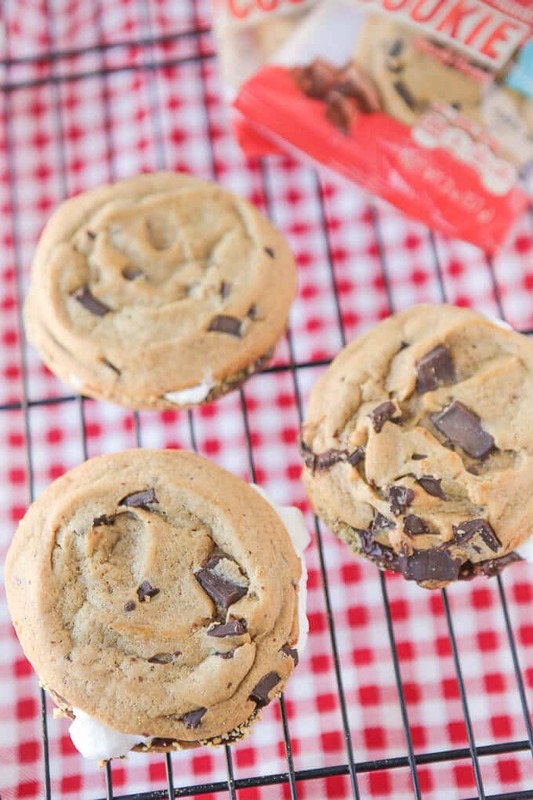 Immediately after your marshmallows are melted, put them on the inside of another cookie. 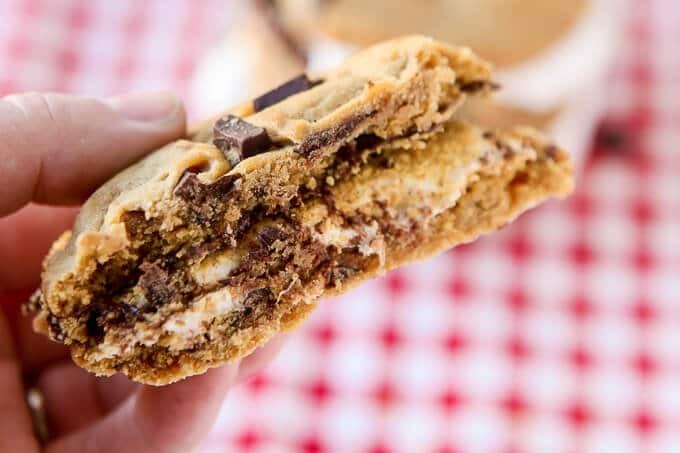 Then smoosh that marshmallow covered cookie on top of the chocolate and graham cracker cookie for one amazing cookie s’more treat. 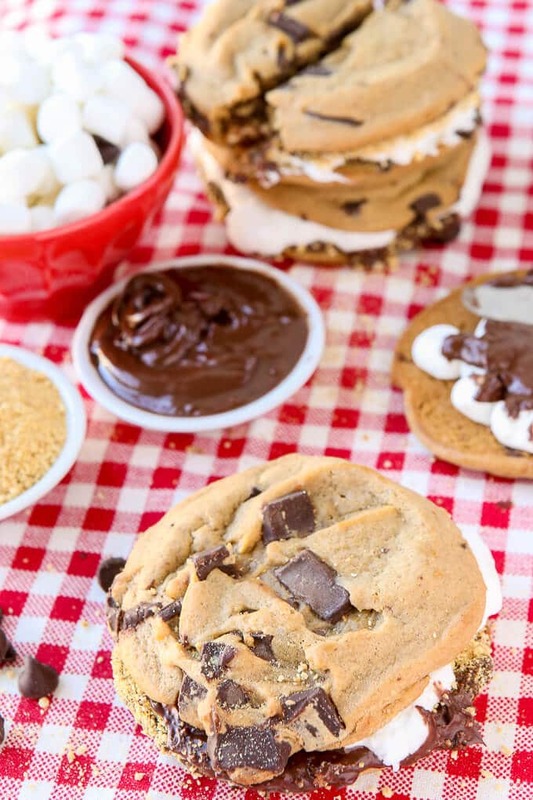 I mean does it really get any better than chocolate chip cookies AND s’mores all in one dessert? I hope you all enjoy National Cookie Day and a cookie s’more or two. If you’re ever in Branson, Missouri in November or December, Silver Dollar City and their s’more cookies at Christmastime are a must! And be on the lookout for the new Otis Spunkmeyer No Funky Stuff line coming out next year! 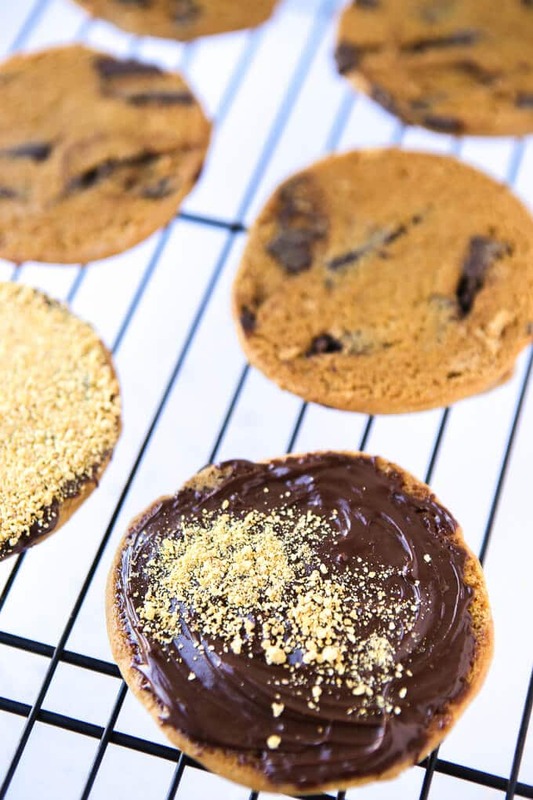 Melted marshmallows, creamy chocolate, and graham cracker crumbs smooshed between two soft chocolate chunk cookies. Flip cookies over so they are laying face down. Spread chocolate spread over one of of the cookies. Sprinkle graham cracker crumbs over chocolate spread and spread around evenly. 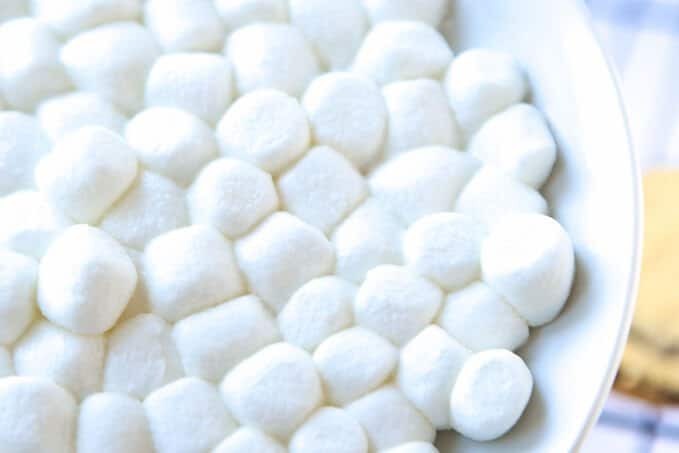 Place mini marshmallows on microwave safe plate and melt in microwave on high for 30 seconds (or until poofed up and heated - watch carefully). Immediately remove melted marshmallows from plate and place on top of second cookie. Place the marshmallow cookie half on top of the chocolate topped cookie half and smoosh together. 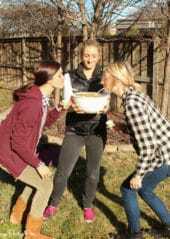 Marshmallows - If you have access to a fire or fire pit, you can actually roast your marshmallows rather than melting in the microwave. Chocolate - If you don't have chocolate spread, you can substitute melted chocolate chips. 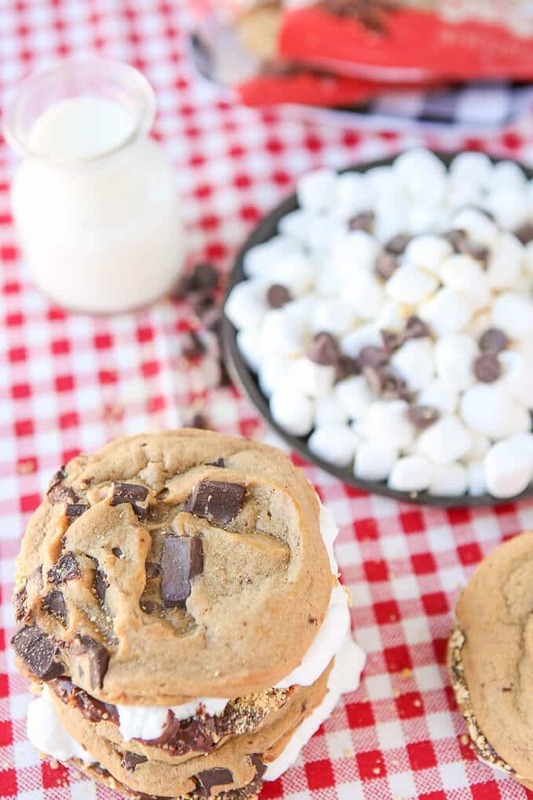 These Cookie Smores look and sound so delicious. I am for sure going to make these with the kids. 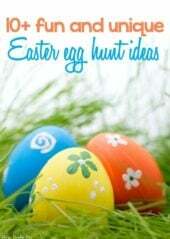 The kids will love these and they are so easy too do. Thanks for sharing the recipe. This looks like heaven in cookie form. I’m sure to gain a million pounds this holiday season. I just can’t say no to all of these delicious treats. 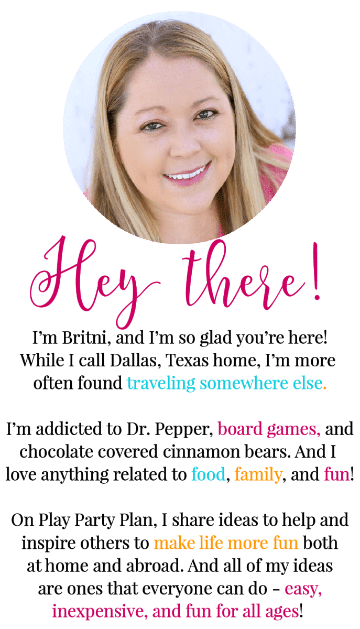 I lvoe Christmas cookies and can always use more recipes! Thanks for sharing these delicious cookies with us! I’m obsessed! I am a s’more expert but have yet to try one this way! Extra chocolate for me please! These are incredible and so much fun! Coaster Christmas sounds like tons of fun! 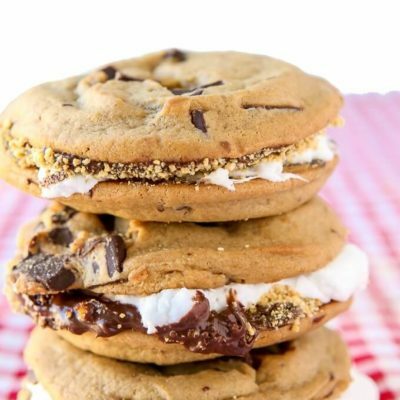 I can’t wait to make these cookie smores, YUM!! !